The pliable world of new synthetic constructions from 3D printing to other forms of rapid prototyping is changing the manufacturing paradigms of the 21st century. 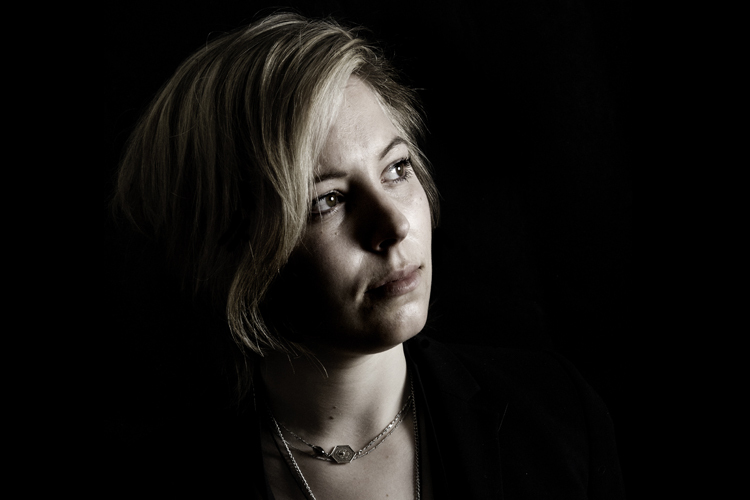 Pauline Van Dongen’s impetus to develop the 3D printed shoe stemmed from a need to create a very small number of custom designed shoes, which led to a collaboration with the seminal Amsterdam-based 3D printing company Freedom of Creation. The result was an ornately detailed, and fantastical shoe, which defies previous cobbling techniques as well as visions. The “MORPHOGENESIS” shoe opens up the design paradigm to unique customization and production flows divorced of present manufacturing means of production. 3D printing, and other rapid prototyping manufacturing schemas, are giving creatives an opportunity to produce limited, on-demand, need-based design objects both locally, and from materials that are increasingly in view of becoming sustainable, thus potentially limiting future carbon footprints while expanding aesthetic expression. I’m a fashion and shoe designer. I graduated from my Master in fashion design in 2010 and started my own label afterwards. 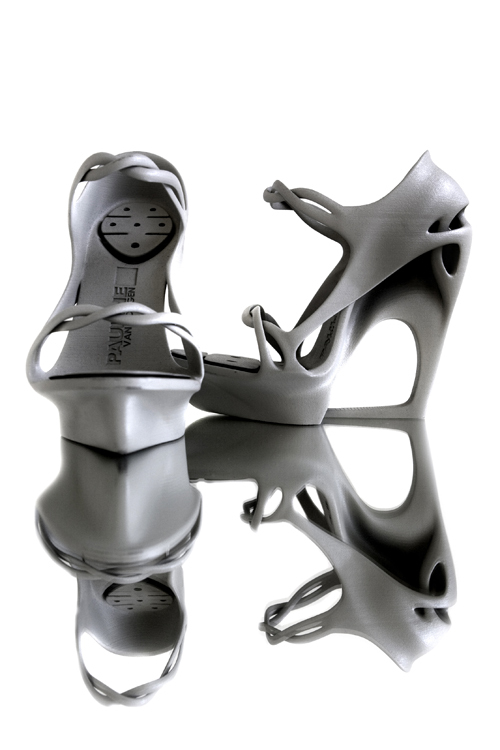 Morphogenesis 3D printed shoe animation from Pauline van Dongen on Vimeo. To me ‘Innovation is the only way forward’. In my work I’m constantly challenging myself to make the impossible possible. I think this is why I’m also drawn to technology, which also has this nature of ‘problem solving’. I prefer to work like a researcher. I think it’s because of my inquisitive nature that I constantly like to surprise myself. I’ve recently started experiments with ferrofluid, not because I see it being applicable in fashion right away but just because it fascinates me. It doesn’t always have to be a newly developed material, but it can be something more traditional like leather that I work with or treat in such way that it gets a new look/surface. So it’s not only about the material but also about applying or mastering a certain technique. One of the challenges when using an uncommon material is finding a good way to finish it in a garment. For example, I’ve worked with ‘crin’ which is a braided nylon and it almost falls apart once you cut it. 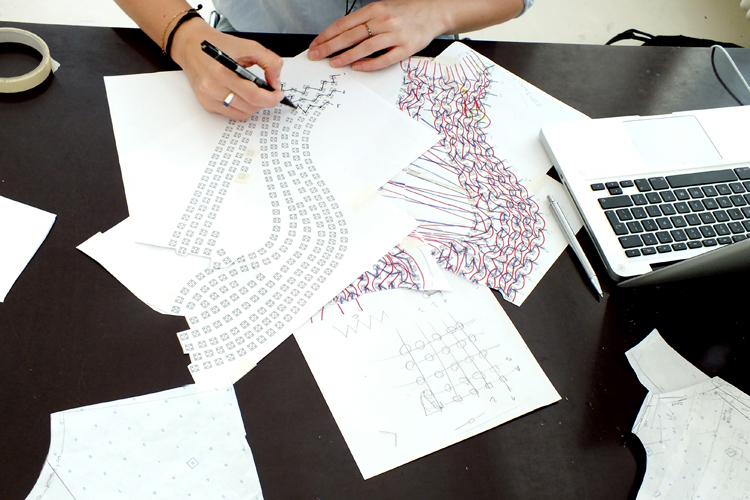 I think technology opens both eyes and doors towards new opportunities; it offers designers new ways of construction or fabrication, the possibility to add certain features to garments or fabrics. It changes perspectives! I’d like to create a fashion-tech design for an astronaut, to wear it during a journey in outer space. This would need a lot of special and high tech features though! To me hi-tech is not solely a dress that moves or a T-shirt that lights up. It’s also about using new innovations that could add certain qualities or enhance performance to the person wearing it. Like using for example nanotechnology to create textiles with, for instance, integrated electronics or self-cleaning abilities. Or using biomimicry, and being inspired by nature’s processes to create water repellent surfaces or phase change materials. To me it’s also about achieving an intelligent design with new characteristics. I do see this becoming beneficial for every day life. 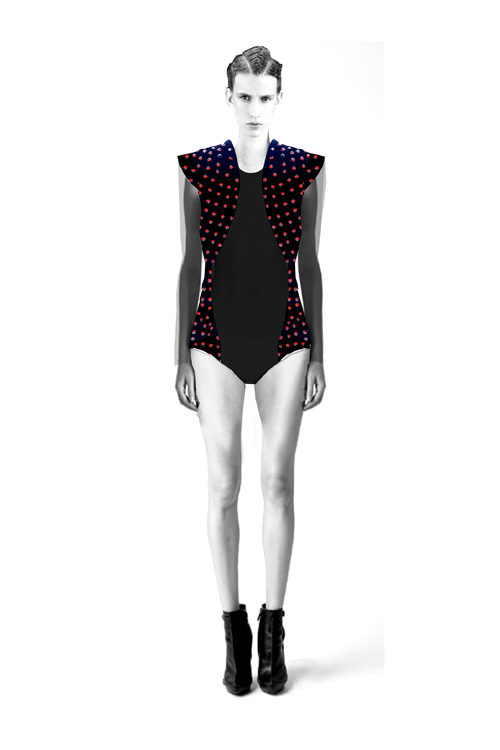 During my residency I’m developing an interactive garment made with flip-dots. These dots are commonly used in a flip-dot display; an electromechanical dot matrix display technology used for large outdoor signs. I’m collaborating with Daniel Schatzmayr, software developer/robot hacker, who helped engineering this kinetic piece. The company Alfa-Zeta has provided me with the flip-dots of which 600 will be covering the upper part of the body and can be individually addressed by a computer to animate patterns swirling around the body. Credits: Morphogenesis: Photography: Mike Nicolaassen; Kinetic Landscapes: Photography: Mike Nicolaassen, Model: Macha at Fresh Model Management, Hair styling: Tommy Hagen at House of Orange, Make-up: Vera Dierckx at House of Orange, Styling: April Jumelet, Shoe design: Anna Korshun, Jewelry: NAT art & Jewelry; FlipDot: Photography: courtesy of the designer.